When a group of international criminals from his past kidnap his daughter, the world's greatest commando sets out for revenge in this action-packed parody of everything you loved about the '80s. A treasure hunter and his crew find a mysterious object while scuba diving off the Florida coast that opens up a whirlwind of extra terrestrial encounters. 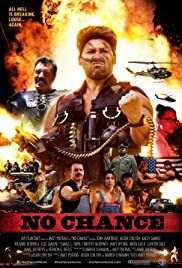 Hilarious Parody Sequel to the greatest action movie ever made is an incredibly fun, glorious, laugh out loud tribute to the films of Arnold Schwarzenegger as well as the 80s action genre on a whole. John Mantrixx (playing himself!) has to escape from a mental institution (don't ask) in order to rescue his daughter Chenny from the clutches of the evil Barrett. Again. And no, those are not typos. Seriously, if you love 80s action movies, you're in for a treat! This send up is so much fun. Director Matt Poitras and his co-writer Jason Chilton (who also plays Barrett) craft such an epic trip down memory lane with so many call backs to the action movies of our youth while simultaneously doing their own thing. And it works tremendously! "Mantrixx" also carries this endeavor beautifully with his hilarious impersonation of Arnold, complete with an "ARRGGHH ARRGGHH!" noise every time he moves! I was literally in tears watching him. So perfect. Chilton is also a joy as Barrett, doing the great Vernon Wells proud. The rest of the cast is amazing, particularly one cameo that is sure to get the audience cheering. You'll know it when you see it. All in all, this was a such a fun time. The kind of movie that feels like if Cannon Group had commissioned a sequel to Commando that was written by the Airplane guys, but directed by David A. Prior on the same budget he made Deadly Prey with. Which is, quite frankly, masterpiece material right there. Its streaming on Amazon Prime right, so if that sounds like your cup of tea, see it ASAP. I highly recommend it!